Mis-Delete my MSN contact last week when I sync to my PDA. Get to know that, when I delete all my PDA contact, it delete all my MSN contacts too!! Thanks to my ex-trainee, Yee Sheng giving me some of this tips to try out. 1. Copy address one by one from your hotmail. Select from contacts in Allow List and right click to Add to contacts. Means to add back to MSN contact list. Please do remember to remove these lines when the msn service gets back to normal. In my case I reinstalled the network card and strangely that seemed to do the trick! If it doesn’t work for you, give the below solutions a try. Try removing any proxy settings, you can do this by following these steps. 8) Start up MSN and give it a whirl! Check your windows System clock and ensure it’s set to the correct time and date. You can try resetting your Internet Security properties to defaults. 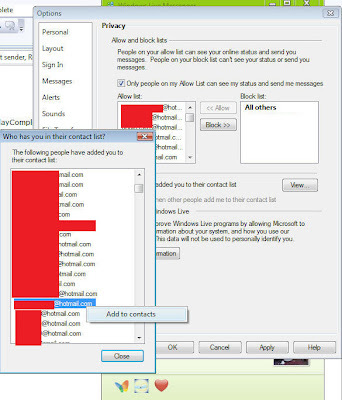 5) Ensure MSN.com or hotmail.com isn’t on that list. If so, remove it. Click ok.
6) Select the Internet Icon and click the “Default Level” button. This will return your Security settings to the default level. 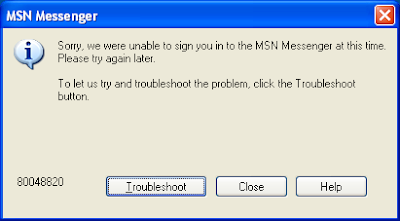 7) Click ok, close down IE and MSN and then try launching MSN. Try and isolate the problem, find out whats causing the the error. If you have norton, turn it off. Does the problem still appear? If not, it looks like Norton is blocking it. Read the Norton manual and find out how to allow programs to access the Internet. This applies to Zonealarm, and other firewall programs. Try to register softpub.dll using regsvr32.exe. 3. Press Enter & Restart Messenger. 1. If you have Norton installed, run LiveUpdate, make sure you have most current version. 2. Delete your Quaruntine and Backup files in Norton. For my self, I tried solution 7, and sometimes it works very well. Create a handy button so your friends can easily add you to their contact list. Buttons make it easy! Use the button builder below to create a button that fits your personal style or even just your mood. Add the button to your Windows Live Hotmail, Outlook and other email signatures, Windows Live Space, or blog, and your friends and family can simply click your button to add you to their contact list. There are several types of button design and colors. Get Code Now!